At the time of writing, approximately 170 of Whitebox GAT’s plugins have been added to the WhiteboxTools library and more are added every day. 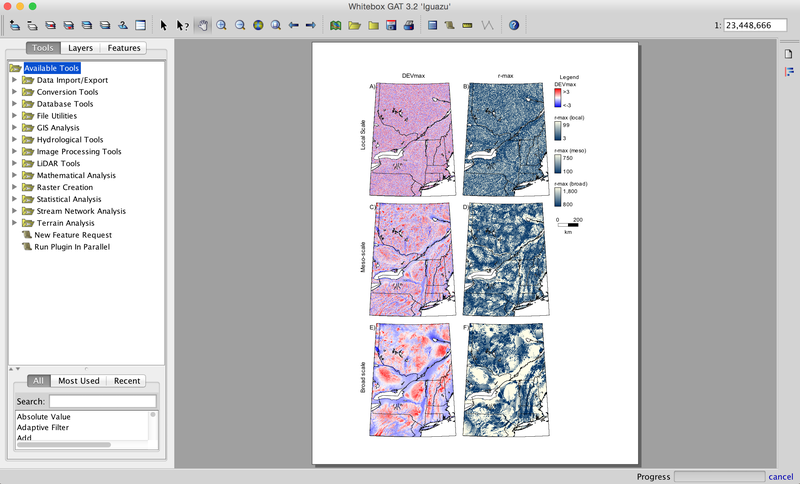 WhiteboxTools is already a powerhouse of geospatial analysis in a small 5MB package! 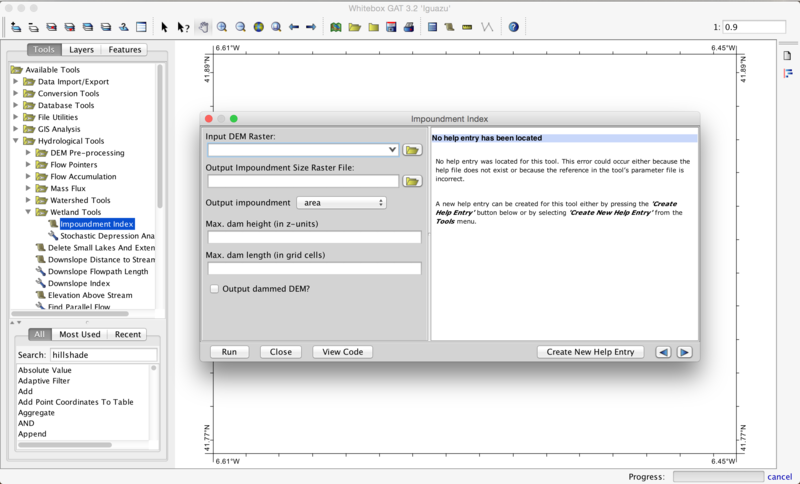 The development to date has focused on porting Whitebox’s extensive raster and LiDAR analysis toolset and vector support will eventually be added as well. 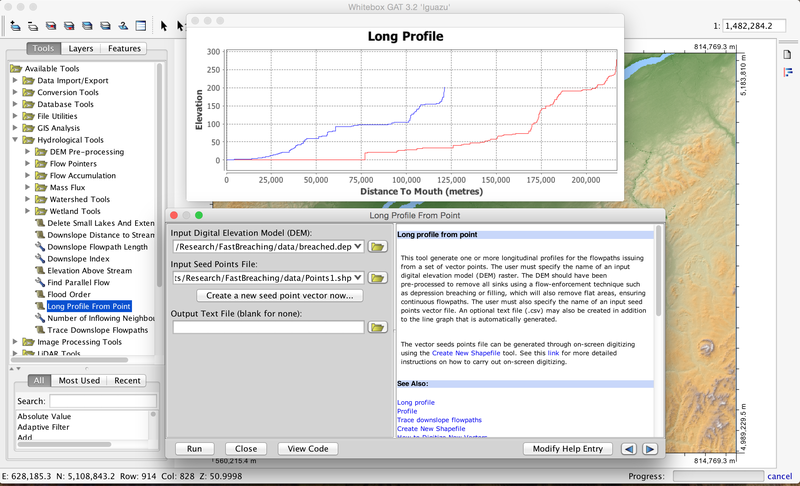 Distributed under the highly permissive MIT license, WhiteboxTools can be embedded into other software projects to provide geospatial analytical capabilities. The library is currently considered experimental; as the project stabilizes, its functionality will be incorporated into the larger Whitebox GAT project itself. Feedback and contributions are always welcome. 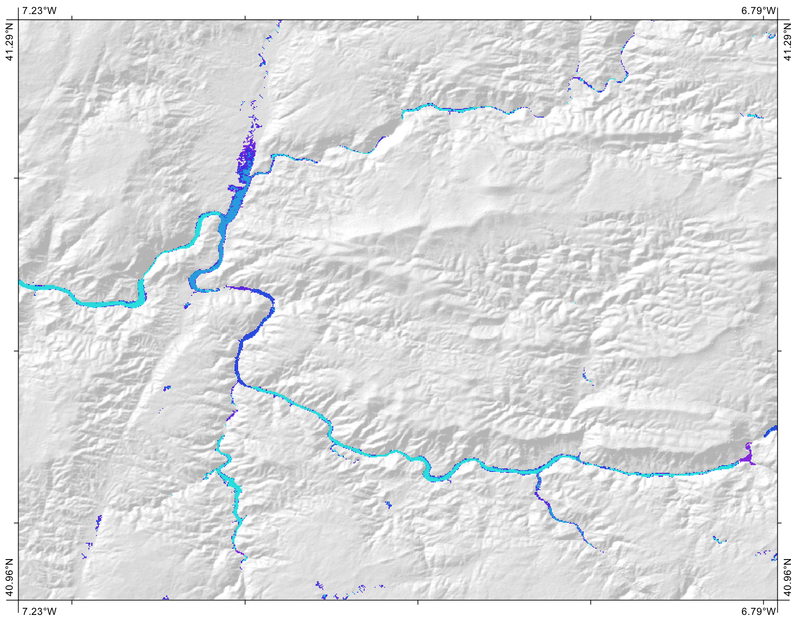 I am very pleased to announce that the open-source geographical information system (GIS)and remote sensing package Whitebox GAT version 3.3.0 (codename Glasgow) has now been released. This version was somewhat delayed because of the transition from Google Code to a GitHub based code repository. However, the transition has now been successful and this new version of Whitebox GAT boasts numerous improvements, enhancements, and bug fixes. Please see the release notes for a detailed description of changes. 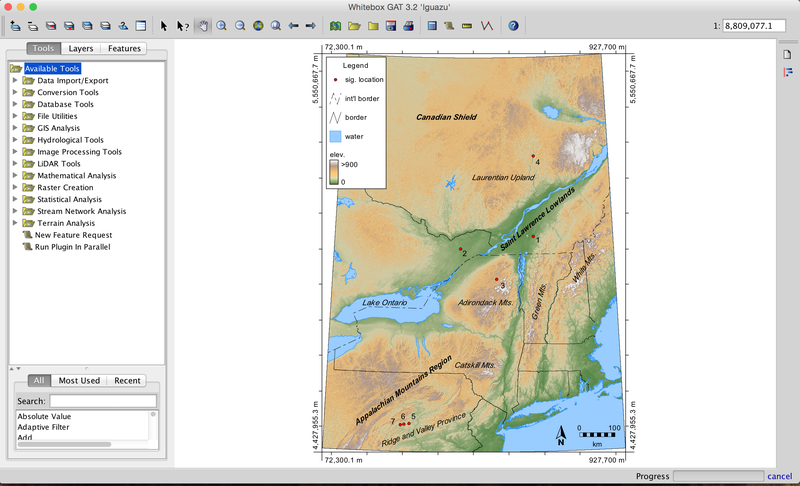 The Whitebox GAT project (http://www.uoguelph.ca/~hydrogeo/Whitebox/) began in 2009 and was intended to provide a platform for advanced geospatial data analysis with applications in both environmental research and the geomatics industry more broadly. It was envisioned from the outset as providing an ideal platform for experimenting with novel geospatial analysis methods. Equally important is the project’s goal of providing a tool that can be used for geomatics-based education. Its unique open-access development model provides easy opportunities for the user community to inspect, modify, and build upon the source code of Whitebox’s many powerful spatial analysis tools. You form a picture of how people from other countries view the citizens of your own nation when you travel abroad. In my job as an academic geographer I have had opportunities to meet people from many countries and have come to realize that people often view Canadians as being true northerners, eking out their lives in the cold arctic tundra. I recall a conversation I once had with a German that I met at a conference I attended in Brazil a number of years ago. The topic of wine came up over the course of the dinner and my colleague refused to believe that I wasn’t joking about the fact that Canada produces wines. After some time I realized that it was pointless trying to convince him otherwise. I’m also reminded of the experience of a Canadian colleague who, when at a conference in Iceland, was offered profound sympathy by an Icelander because it must be ‘so brutally cold in Canada, even this time of year’. It was June. I can understand why many people might view Canadians as being isolated, tundra-living northerners, wearing fur hats year ’round. After all, when you look at a map of the world, it’s difficult to miss the enormous, and largely arctic territories of Canada, second only in the world to that of Russia. Of course, the misrepresentation of high-latitude landmasses in most common map projections doesn’t help this situation any. The problem is that when you only know a very little about a country and its culture it’s easy to make assumptions based on what you glean from a world map. But there’s a difference between a nation’s territory and its population. While it’s true that there are Canadians that do live at extreme latitudes within the arctic, the vast majority of Canadians live considerably farther south. Oh, and no Canadian lives in an igloo, although we all can build good snow forts and defend them with our accurate snowball throwing skills. The fact is that most Canadians live farther south than the citizens of many European nations. Many Canadians are more likely to visit higher latitudes by traveling to Europe than by visiting Northern Canada (a sad fact perhaps). The image of the Canadian Northerner is so deeply entrenched that even many Canadians would have a hard time believing otherwise. We have taken on the Northerner persona in our own cultural identity. But is it deserved? I decided to look at this a little deeper using the analytical capabilities of Whitebox GAT. First, take a look at the figure below, which compares the population distributions of various Northern Hemisphere nations by latitude and ranked by their medians (i.e. the latitude below which 50% of a nation’s population lives). Notice how far down Canada appears? It’s also evident from this figure that Russia, Canada, China, and the US have greater latitudinal population variation than the other nations represented in the analysis; they’re geographically large nations after all. However, in each case, the population distributions of these largest nations are heavily skewed to their southern territories, and none more so than Canada. If we’re a cold-loving winter nation, you wouldn’t know it from the latitudes we choose to settle. 90% of Canadians live south of more than 90% of British citizens (bonus fact: London, Canada is nearly 1000 km south of London, UK). 65% of Canadians live south of 47°N while 65% of French citizens live below a more northerly 48.9°N (bonus fact: Paris, Canada is nearly 630 km south of Paris, France). About 70% of Canadians live south of the 49th Parallel, which forms the border between Canada and the US west of the Great Lakes (Lake of the Woods, actually). More than 30% of Canadians live at latitudes overlapping with Spain. More than a quarter of Canadians live south of the northern most 10% of Chinese citizens. More than 50% of Canadians live farther south than more than 28% of the Northern Hemisphere’s entire population. This analysis can be further summarized with the following table, which compares nations by the proportion of their populations living south of various latitudes. Table 1: The percentage of the populations of various northern hemisphere nations living south of 45.50°N, 49.25°N, and 51.25°N. It is apparent that the vast majority of Canadians live farther south than the Nordic nations to which Canada is frequently compared. Given their (broadly) similar size and northerly geographic positioning, Canada is also frequently compared with the Russian Federation, while this analysis demonstrates that Russia populates its northern territories far more than does Canada. Lastly, ranking countries by their median population latitude, we find that Canada is perhaps much further down the list than one might expect, at number 36. Table 2: Top 50 countries of the Northern Hemisphere ranked by the latitude of their median population (i.e. the latitude below which half their population live). Does this mean that Canadians don’t experience harsh winters, as is often portrayed? Well, the fact is Canada is a very large nation and it’s hard to make sweeping generalizations about something as vaguely defined and variable as ‘the Canadian Winter’. Certainly there are places and times when Canadians experience extreme winter conditions (that’s how we develop those world-class snow fort building skills). At the time that I’m writing this (late February 2016), it is -24 degrees Celsius in Yellowknife, NT (62.4°N) with a snow pack of well over a metre, while where I live in Southern Ontario (43.6°N) it is currently +4 degrees Celsius and there isn’t any snow in my front yard at all. Last year at this same time it felt more like Yellowknife in Toronto. Variation is the norm. For many Canadians, the dominant factor affecting our weather is more the extreme continentality (distance to ocean) rather than the latitude. This is the same reason why we usually experience very hot summers, a fact that people outside of Canada frequently don’t realize as well! The data that I used to complete this analysis was taken from the Free World Cities Database provided by MaxMind. The database provides the latitude and longitude coordinates of world cities, along with their countries and populations. The accuracy of population estimates varies by country, but is expected to be high for the nations used in this comparison. The smallest Canadian settlement recorded in the database had 540 people (Mayo, Yukon), which is indicative the level of detail in the data. The use of the World Cities data set also implies that rural populations are not accounted for in the analysis. While this is a limitation of the method, the fact that large urban settlements tend to grow within the richest agricultural regions suggests that the population distribution depicted by the data set should correlate well with the overall urban/rural population of nations. The analysis was carried out using Whitebox Geospatial Analysis Tools. I wrote using script in Whitebox’s Scripter using the Groovy programming language. This short script digested the MaxMind database and calculated the cumulative frequency distribution of each country’s population by latitude and output a report table for each of the target countries used in the comparison. It was quite a fun way to procrastinate while marking mid-term exams and a good way to show off some of Whitebox’s capabilities for data science. There are a few exciting announcements related to new developments on the Whitebox GAT front. The first is that due to changes in the Google Code practices (it has become ‘read only’ and is no longer accepting new code commits), the Whitebox project has moved its source code repository to GitHub. I think that this will eventually make for improved source code management, although there may be some initial transition issues that we’ll need to work past. Some of the documentation will have to be updated to reflect this change. The second announcement, which I am most excited about, is that I have finally found the time to update the Whitebox GAT website. There is a fresh new and more professional look to the site. I hope you enjoy the new webpage and as always, feedback is welcome. What would you like to see added or changed? Lastly, Whitebox GAT just got a new little brother called GoSpatial. GoSpatial is a command-line interface program for analyzing and manipulating geospatial data. It has been developed using the Go programming language and is compiled to native code. 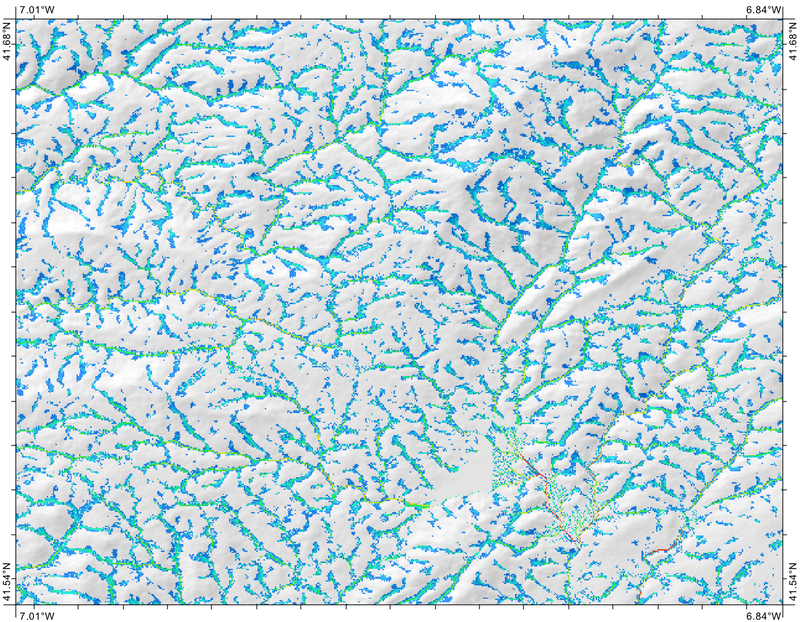 The project is experimental and is intended to provide additional analytical support for the Whitebox Geospatial Analysis Tools open-source GIS software. GoSpatial can however be run completely independent of any other software and is run from a single self-contained executable file. 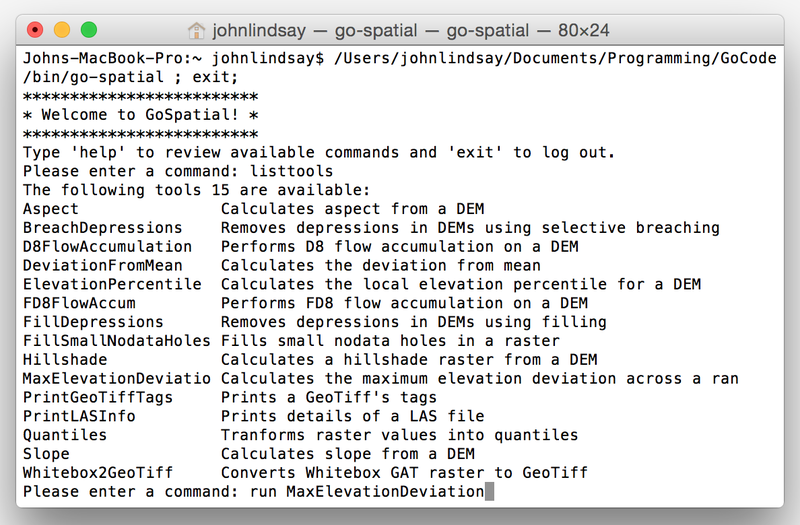 The GoSpatial geospatial analysis command line tool.